A & B gazebos add to the spa experience by offering protection from the elements, privacy and convenience, setting a new standard for gazebos quality. Not only are the fit and finish of our gazebos above any other unit on the market, we have raised the bar with true solutions to problems commonly seen with our competitors. For those in temperate areas of the country, our gazebo option with four open sides or a pavilion structure provide both shade and shelter. If your gazebo will be subject to more severe exposure, our fully enclosed units will keep you cozy and free of insects while enjoying your spa. Live on the coast? 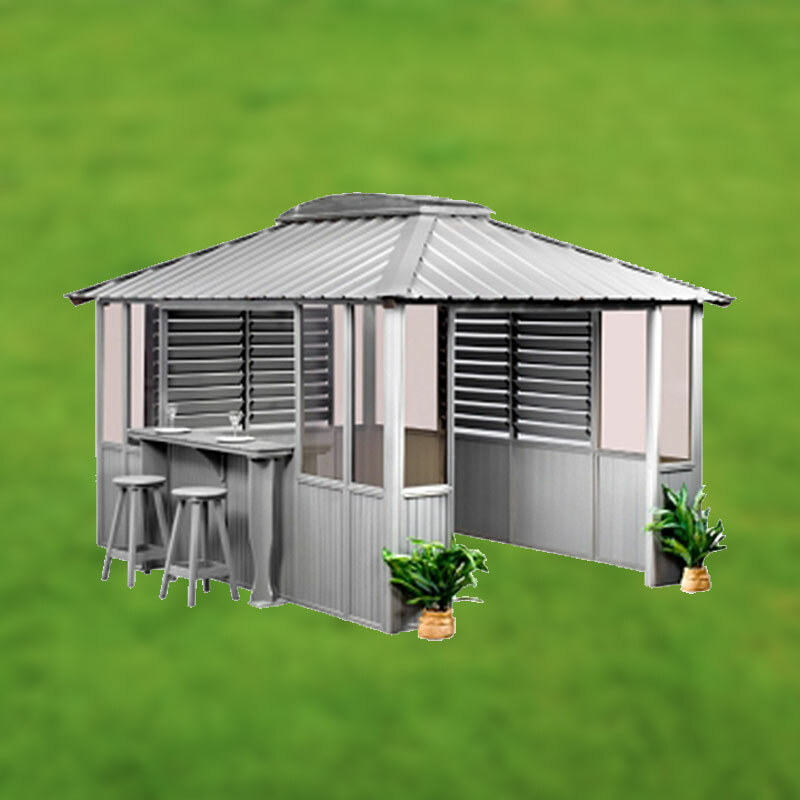 Add louver options to your gazebo for privacy and breeze control. Features such as residential-grade aluminum windows and doors offer excellent performance, ease of operations and simple maintenance. Our Galvalume metal roof systems have a 40-year warranty and will withstand 100 MPH wind gusts as well as 45-lb. snow loads. Envirotech HDPE is a durable, maintenance-free material that will look great after years of extreme exposures.Our furniture-grade high-density material is made from 100% post-consumer recycled plastic. It has a wood grain texture and solid color throughout (meaning scratches won’t show), with an incredible 50-year warranty. 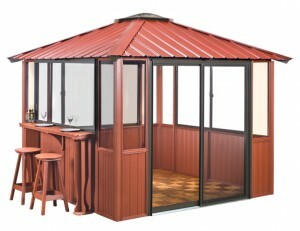 We currently manufacture our Envirotech gazebos in Chestnut Brown, Coastal Gray, and Deep Red. Our furniture-grade high-density material is made from 100% post-consumer recycled plastic. It has a wood grain texture and solid color throughout (meaning scratches won’t show), with an incredible 50-year warranty. We currently manufacture our Envirotech gazebos in Chestnut Brown, Coastal Gray, and Deep Red.We encourage you to take a look at our gazebos brochure or to continue reading to find the structure that will best enhance your yard.